Wow, someone has the same story as I do. Please see above story from “Please, i’m tired”! Exactly my story and I could add - no battery life left. Only works while plugged in. 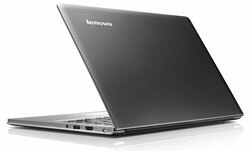 Do you have two Lenovo Ultrabook’s to give away?? I would like to replace my old desktop! This sounds like a great computer and I won’t have to use my husbands. and back. Cracked bezel, scratched up lid. I’d love to have a new one so the cool kids will stop laughing at me. This ultrabook would come in handy for my music mixing and surfing/sweepstakes entering, haha. Thanks for the giveaway! My son is finishing high school this year. He is going to need a new computer for the digital arts college classes he will start in the fall. It would be really nice to have one that can keep up with his needs for his schooling. I’ve had the worst life up to this day and I could really use this to get a fast and efficient way to search and find better opportunities to secure my future before time fades away. Got a new baby on the way, and I’d love to give a new laptop to my mom so she could actually watch baby videos on it. Her old decrepit desktop is hardly functional! I want a new laptop. The netbook I have is so slow. It won’t quit freezing also. And I actually have high speed internet. My husband’s laptop just went out! We spent what extra money we had getting one for my nephew for Christmas, not knowing we would need one a month later! Oh I need this. My old Dell is on her last legs and to quote Dr. Seuss “Oh the places you’ll go! Who soar at high heights. Wherever you go, you will top all the rest.” Oh the places I could go! "Why do you need a new Intel-powered Ultrabook?" My husband and I travel a great deal and the Lenovo Ultrabook would really suit our needs. At present my husband has a very old laptop computer that is heavy and has a very short battery life. I’d love to win this for him. I have a Dell desktop and it’s always crashing!! !besides having to wait in line ,behind my 3 daughters,son-in-laws,5 grandkids,even my 83 yr old DAD and none of them live here!....it would be nice to able to still get some compter work done and be out in the back yard with the grandkids this summers. I’d love a laptop to work on at home. I’d also use it as a demo in my classroom. The admin would like it so much that they would run out and buy one for each of my students. Productivity would spike, students could collaborate easily, and grades would go up. I’d get a bonus for all the A’s. Parents would give me great gifts, and give me enough money to put down a down payment on a house….. It would all start with one laptop. So, pick me. I really need the Lenovo because I’ve never had a new, just-for-me computer, and my kids burnt up (overheated) the laptop we used to have. I need a new one to replace the old one I use at school. It is literally “dying” on me piece by piece! Would love to get a laptop for my granddaughter.. I never get to use our computer. My husband always has it. I would like to win this because when I am on the road I miss my computer. Have a cell phone with a data plan, but the screen is blinding me because it is so tiny. We are expecting our 2nd child and while I am not anticipating bed rest, it would be nice to be prepared with a nice laptop. Maybe it would even drown out my 3 yr old if I have to deal with bed rest! I loaned my laptop to my girlfriend because her Apple crashed and Tech hasn’t helped! I am 51 and dont own a notebook I have internet on my phone. I need to buy one for school its hard to afford because I live on my disability and also have custody of my 4yr old grandson.This would be the present I have ever gotten!!!! Please pick me.. Thank you. I worded my paragraph wrong. I worded my paragraph wrong. I dont own a laptop. I have never won anything and this laptop would greatly be appreciated and would be the greatest gift I have ever received. I have 4yrs. of school ahead of me, I want to eventually start my own business and get off of disability. I need the Lenovo because my current laptop is old and outdated. I also can’t afford any type of tablet. Economy not so nice to this PR professional. I have had a laptop for a while now, but the battery life is very short. If I could win this new Ultrabook, it would give me the freedom to use my laptop more while on the go. therefor, I could really get the maximum usage out of the product. 8 hour battery life is impressive! My wired home computer is so old!!!! But my husband & I still fight over using it. It is 8 years old and can barely support anything I do…it crashes all of the time. But, it works fine for my husband to look at car parts on eBay. I need a computer of my own to ‘see’ my friends and play games….having a little more harmony in our marriage would be a wonderful bonus! My mom is using an ancient desktop PC with a dying power supply. So she needs an upgrade! I need(want) to be able to take my computer to my work where I need to use it. A laptop would be very wonderful! My current laptop.netbook is acting weird, sometimes just goes black and needs a reboot. Winning a new one would be so much nicer than having to buy a new one. IMHO. You are always on my mind, you are always on my mind. I manage a small, but very busy library. we never have enough available computers. There are times when I let patrons use mine when they’re in a hurry, especially if they need to print something. Having a nice portable machine like this would allow me to keep working anywhere in the library and that would be huge. In all honesty I don’t really “need” a new laptop. But the poor deprived little techie deep inside of me is screaming at the top of her lungs “me, me, I want it!!! !” and threatening to hold her breathe until she turns blue if I don’t at least enter for a chance to win. The things we do to silence our inner voices…. I never win anything but I keep trying!! Someday I’ll win something!! I go to my daughters house everyday to watch my 4 grandchildren so she can work. But being away from my home and only computer (desktop) has a negative effect on my own DSA venture and income. If I had a laptop to take with me, I could not only care for the children but also generate business for my own income. Thank you for the opportunity. Mine crashed and died, and I can’t afford a new one since I’m laid off and not getting unemployment, so I can only job search at the library where I have to wait in line and there’s an hour limit, really makes it difficult to get much done. I don’t currently have a laptop. I have an old desktop and it sure is heavy to carry around. My back is killing me!! My Chiropractor Will Thank You! I’m on the road every day so I need a lightweight laptop instead of the nearly eight-pound behemoth that I’ve been lugging around, which like me, is on its last legs. I need a sweet laptop for the kids to use, to surf the internet for children’s activities, to, um,.... OK, I just want it for me, me, me…. My husband could really use this, he is going back to college. I have an old Dell Desktop that I share with the kids and have been wishing for a laptop. Portable, powerful, MINE. What more could I ask for? As a Red Cross Disaster Action Team member I am called out to assist families burned out of their homes with temporary shelter, food and clothing. Time is of the essence because some families barely escape with any clothing much less that needed to deal properly with winter conditions. Having good reliable tools helps us help others more quickly. All the paperwork required can be completed more quickly and possible food and shelter options arranged faster if we had better tools. A Lenovo Ultrabook is the ideal choice for this totally free volunteer service. Those in need would be better served if we had such a good tool available. Why I need a new Ultrabook. With 6 kids at home and both my husband and I on disability, we’ve got no extra money to buy one. We homeschool, because there’s no reason to have someone else watch our kids. Therefore it would help us tremendously with research for different school projects. Having a pc that we can use reliably and not worry that it’s gonna break down soon, because of it being a cheap old one. I havent been able to afford a new laptop and my current one is about 5 years old—help!! I already get your newsletter, thanks! I need a new laptop because my current laptop is so worn it is missing 4 keys on its keyboard and I’ve had to add a cordless mouse just to use it.